Cambridge scientists say they’ve grown a miniature brain in a petri dish that seizes control of biological material around it. 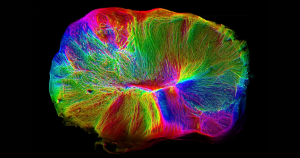 Unlike previous lab-grown brains, this one actively will send out “tendrils” to connect to a spinal cord removed from a mouse, according to The Guardian — and can then use its new spine to control a mouse muscle attached to it. The brain, which The Guardian described as a “lentil-sized grey blob of human brain cells,” represents a significant step forward because of its eerie ability to connect to a rudimentary nervous system. Its creators are hoping they’ll be able to use it — and other organoids like it — to study brain and nerve diseases on a small, controlled scale.